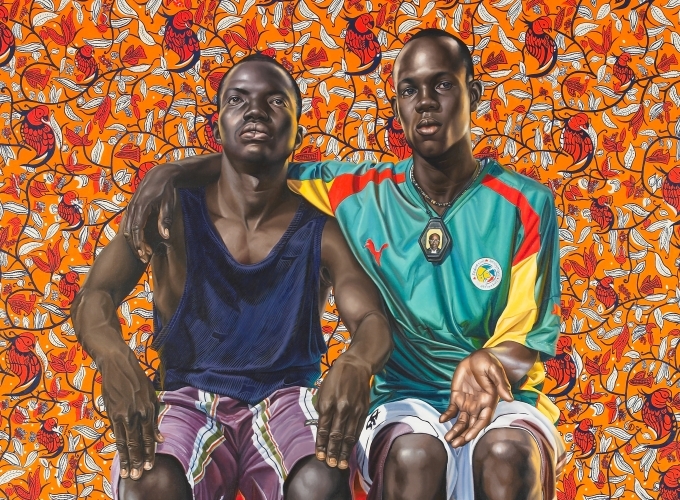 Sean Kelly announces An Economy of Grace, Kehinde Wiley’s debut exhibition at the gallery. 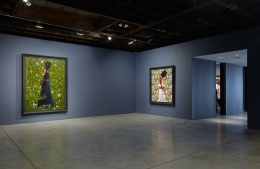 The exhibition represents a significant departure from Wiley’s previous subject matter by depicting African-American women, his first-ever series dedicated to female subjects. The models for the paintings were cast on the streets of New York City. Their poses are based on historical portraits of society women by Jacques-Louis David, Thomas Gainsborough and John Singer Sargent, among others. Instead of representing the models in their own clothes, as is the case with his portraits of men, Wiley has collaborated with Riccardo Tisci, Creative Director of the famed French couture house Givenchy, to design long dresses for the women. 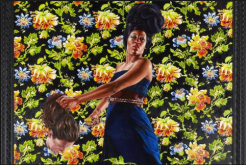 As creative collaborators, Wiley and Tisci spent numerous hours together walking through the galleries of the Louvre and discussing both the aesthetic and conceptual context for the project, specifically society’s ideals of feminine beauty and the frequent marginalization of women of color. Following these conversations, Tisci designed six unique dresses for the models. 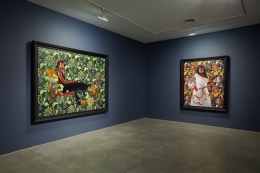 The resulting paintings to be shown in An Economy of Grace are a celebration of black women, creating a rightful place for them within art history, which has to date been an almost exclusively white domain. A documentary film project about An Economy of Grace is being produced in conjunction with Remy Martin®, and directed by award-winning filmmaker Jeff Dupre. Interspersed with personal dialogue, historical narrative, and critical commentary, the documentary will offer unprecedented insight into the artist’s oeuvre and the dynamic collaboration between Wiley and Tisci. It will also share the personal stories of the young women chosen as the models, with insight into their lives and backgrounds. Wiley’s works have been the subject of numerous exhibitions worldwide and are in the permanent collections of several museums, including: The Metropolitan Museum of Art, New York; Studio Museum, Harlem, New York; Denver Art Museum; Los Angeles County Museum of Art; Hammer Museum, Los Angeles; Walker Art Center, Minneapolis; High Museum, Atlanta; Columbus Museum of Art; Phoenix Art Museum; Milwaukee Art Museum; and Brooklyn Museum, New York. 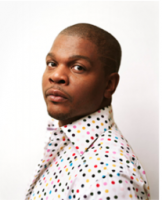 A comprehensive monograph, Kehinde Wiley, is being published by Rizzoli New York and will be available for sale at the gallery throughout the run of An Economy of Grace, and from May 15, 2012 wherever fine books are sold. 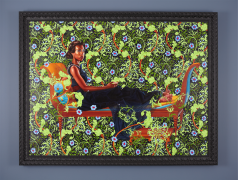 Wiley was commissioned to paint a portrait of singer/songwriter/producer, Santigold. This stunning painting graces the cover of the singer’s new Downtown/Atlantic Records album, Master of My Make-Believe, being released May 1. 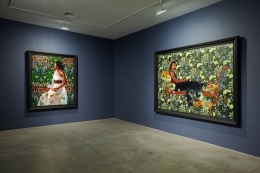 The Jewish Museum, New York, is exhibiting Kehinde Wiley/The World Stage: Israel through July 29, 2012. 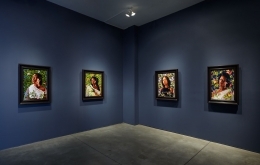 The exhibition features 14 large-scale portraits of Israeli youths, from diverse ethnic and religious affiliations, alongside 11 works — papercuts and textiles — chosen by the artist from the Museum’s collection. Halperin, Julia. 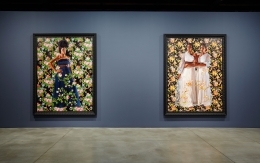 “Kehinde Wiley Collaborates With Designer Riccardo Tisci...," ARTINFO, April 20, 2012. Lynch, Matthew. 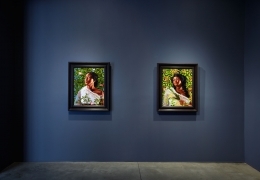 “Kehinde Wiley Turns Eye on Female Subjects,” WWD, April 20, 2012. 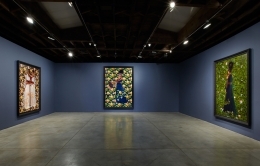 Miller, Michael H. "Kehinde Wiley’s First Show at Sean Kelly...," Gallerist NY, April 20, 2012. “The Art of Givenchy,” Style.com, April 20, 2012.